RENTON, Wash. – The pain would only last 10 hours. That’s what Seneca Wallace told himself as he sat in a chair from 10 a.m. to 8 p.m. on a Monday in the spring of 2007. The Seattle Seahawks’ quarterback had flown to Southern California to meet with renowned tattoo artist Mike DeVries, and soon he felt the needle on the right side of his abdomen. To endure the pain, Wallace thought of one thing. He thought of the woman whose image was being tattooed on his skin. He thought of his mother, Linda. “It was painful, but in the back of my mind, I’m thinking: after what my mom had to go through, this can’t be that bad,” Wallace said this week. What Linda Wallace went through was the kind of eight-year journey that makes a tattoo needle – not to mention getting sandwiched between two 300-pound defensive lineman – look like child’s play. 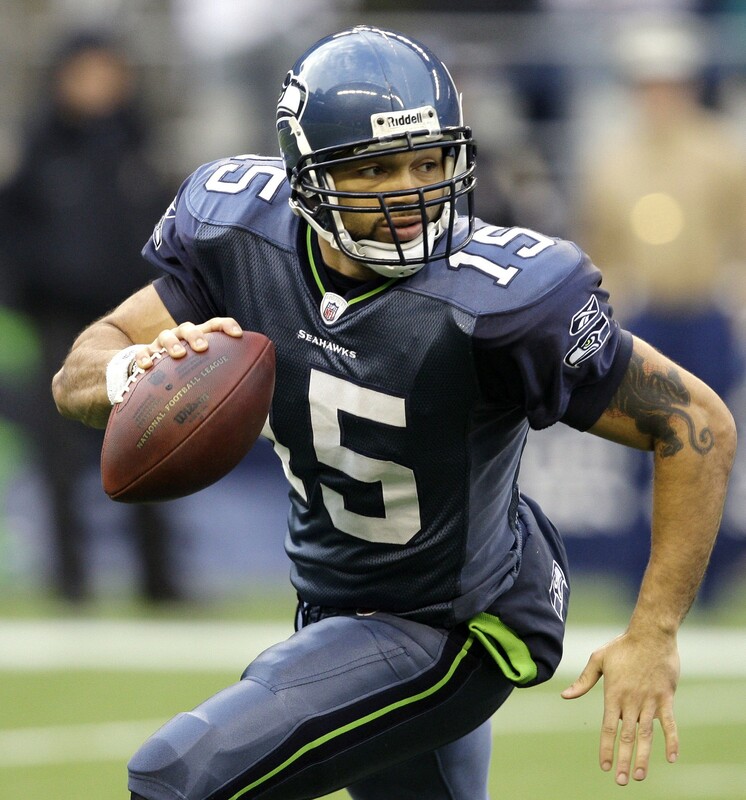 For eight years, Seneca Wallace’s mother battled Multiple myeloma, a type of cancer that attacks the plasma cells and affects a person’s immune system. She lost her battle in March 2007, yet the Seahawks’ 28-year-old quarterback won’t soon forget her. “She’s on my mind all the time,” he said. The memories come at unexpected times, like during a game at St. Louis earlier this month. Wallace took the biggest beating of his career behind a young offensive line that included four non-starters. Contradictory to his easy-going nature, Wallace teed off on a few teammates after a hard sack late in the second quarter. He eventually led the team to a comeback victory and broke down in tears afterward. Unexpectedly, he had been overcome by his mother’s memory all afternoon. Linda Wallace was diagnosed with cancer in 1999 and spent the rest of her life fighting. In the days leading up to his first NFL start in 2006, Linda Wallace skipped a doctor’s appointment so that she could watch her son’s game in person. Theirs was not a typical mother-son relationship. Linda and O.T. Wallace, Seneca’s father, separated when Seneca was about 11 years old, at which time his parents began living in different homes. While they never officially divorced – “they stayed together just for us,” Seneca said of himself and two stepsisters – the Wallaces continued to have a strained relationship that drove Seneca and his father apart. By the time Seneca started junior college and eventually transferred to Iowa State, the relationship with his father got worse. Wallace continued to lean on his mother, only to get the worst news of his life when he found out that she had cancer. Eight years later, she was gone. It was the kind of loss that makes a bad NFL Sunday seem trivial, which helps explain why Wallace has such an unflappable personality. Losing his mother, he said, is the worst kind of pain he could possibly endure. There are times he felt like he didn’t get closure in his relationship with his mother, despite several occasions when he told her how much she meant to him. The final time Wallace heard his mother’s voice came in the form of an unreturned phone message he received while on vacation. Wallace never got a chance to say goodbye, and he feels like he didn’t get to tell her everything he had wanted to say. Two weeks after his mother’s death, Seneca decided to honor her with a tattoo that runs from his right hip to the middle of his rib cage. He found DeVries during an internet search and flew to Northridge, Calif., on two days’ notice. It doesn’t take a Theologian to know who that angel might be. With mother watching over him, Wallace has quietly come into his own this season. He has started seven games in place of the injured Matt Hasselbeck and has posted an impressive passer rating of 90.9. His rating of 104.8 in the fourth quarters of games ranks second in the NFC, trailing only the Dallas Cowboys’ Tony Romo. And Wallace hasn’t thrown an interception in his past 183 attempts. “He’s put together some good games now,” coach Mike Holmgren said this week. “Shoot, he’s throwing passes without throwing interceptions, he’s moving the chains, he’s giving us a little spark with his legs. While he is likely to remain Hasselbeck’s backup when the veteran quarterback returns, Wallace has proven that he’s capable of being an NFL starter. Not all change is good, as Wallace learned two years ago. But thanks to his memories and a new tattoo, Wallace’s mother will always be with him.